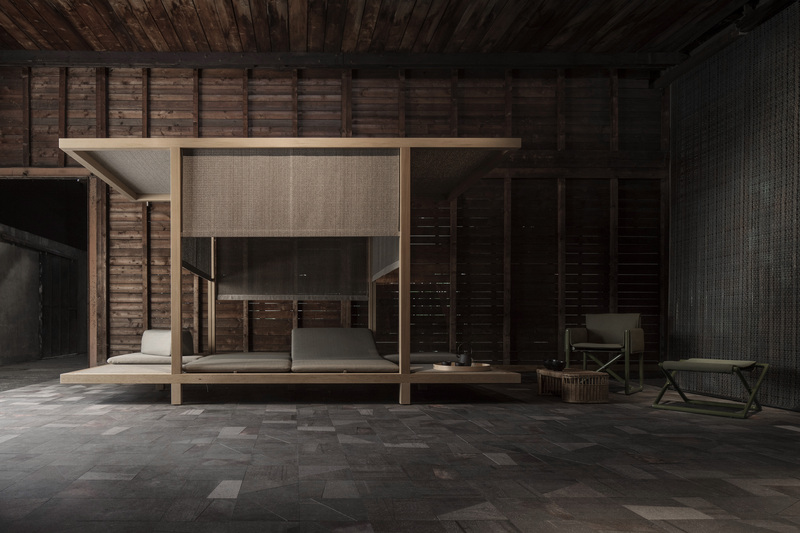 Toku is a shading structure made of cedar heartwood treated with a transparent impregnating product, which makes it suited to an outdoor use also in harsh weather conditions. The structure features four panels, two are fixed and two have adjustable backrests. They can be moved and arranged according to one’s needs. The panels are padded and covered with Wara, the new signature outdoor fabric with the colours and the appearance of straw; comfort can be enhanced by using soft pads covered with fabric. The top covering is fixed in the central part and vertically adjustable on the four sides thanks to sliding elements inserted into the structure; it is made of Thuia fabric.